This original artwork is a 2016 acrylic on canvas and depicts stolen moments, night and people. The size of this art painting original is 32 x 48 in. Honeymoon Night by Jerusalem artist Meir Amar is a romantic expressionist painting detailing a husband and wife in full wedding attire taking a romantic stroll through a colorful park in late summer, the dark purple evening sky contrasting with the warm yellow light from the street lamps. The wedding dress flows to the ground, which is painted in an array of vibrant strokes, reflecting the colorful leaves above. In the background, the shapes of city buildings faintly mark the boundary of the park. Signed by the artist on the Front Bottom Left. Meir Amar was born in Israel in 1979 and grew up in the ancient “Machne Israel” neighborhood in Jerusalem. He inherited his talent for drawing and passion for the arts from his father, the artist Mommy Amar. When Meir Amar joined his military duty, Commander Benny Gantz, former chief of staff, recognized his great potential to paint murals in army bases as part of an art and cultural program. Meir became the official artist of the Israeli Defense Forces and his murals can be seen in many of the bases all over the country. Meir Amar is a graduate of the School of Arts "Bezalel" Jerusalem. Immediately after graduating he won a full scholarship to study art at the “Israel Museum” and worked under the guidance of artist Mark Yanai. Meir is known for his large scale paintings and strong use of color; he combines expressionist and figurative genres with Jewish spiritual elements in his work. Meir Amar's works of art are shown worldwide and have left their mark in London art centers, museums, galleries and private collections around the world. Winter in Jerusalem by Meir Amar shows the beauty of this great city under a light skiff of snow captured in expressionist technique. The melting snow is creating pools which reflect the colors of the architecture and trees, creating a world of yellow with a snowy gray sky. 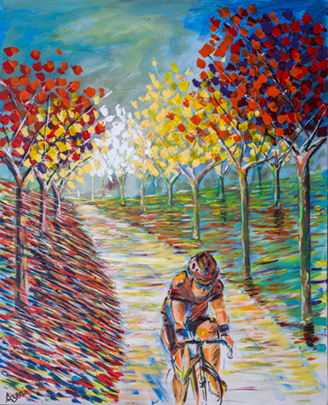 Autumn Ride by Meir Amar is a neat expressionist painting of figurative exploration. This landscape shows a richly colorful forested park in the fall as the leaves are turning. This park harbors a sidewalk littered with the turning leaves and a bicyclist pedaling through the multicolored landscape captured in shades of green and red with splashes of yellow and blue. 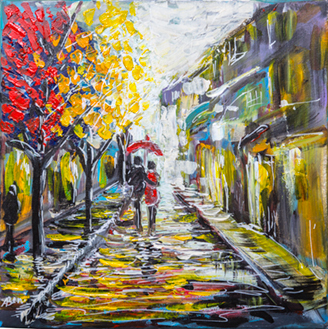 A Walk Before Bedtime by Meir Amar is a vibrant expressionist painting that shows the world through the eyes of two people in love: a world full of life, color, passion, and intensity. 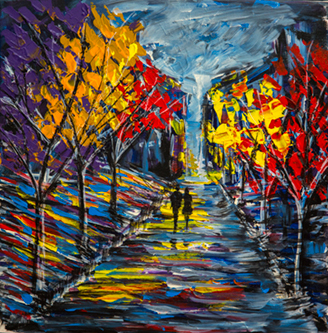 This is romantic take on a fall landscape full of turning leaves divided by a broad path, composed in a rainbow palette of red, orange, yellow, purple, and blue.